Hi there, my darlings! This morning, as always before ending our featured event, I'd like to share with you my review of a few products from this week's Friend-An-Indie-Friday sponsor, Eat. Sleep. Polish. Cat sent me 3 gorgeous polishes and a selection of her new decals to review for all you. All 3 are right up my alley--the girl knows me too well! =) So let's take a look, shall we? First, I have for you Midnight Madness--a black linear holographic polish. Fabulous application and formula--it went on smooth and dried super quick! In the store description, Cat promised this was a two-coat wonder...and it is indeed! The swatches below show 2 generous coats by itself. Love a good black holo? Well, you're in luck! Next up, I have for you Raspberry Gummy Bear--a raspberry jelly polish with a linear holographic finish. Again, Again, no complaints at all with formula or application and the swatches below show 3 thin coats by itself. I absolutely love this color! 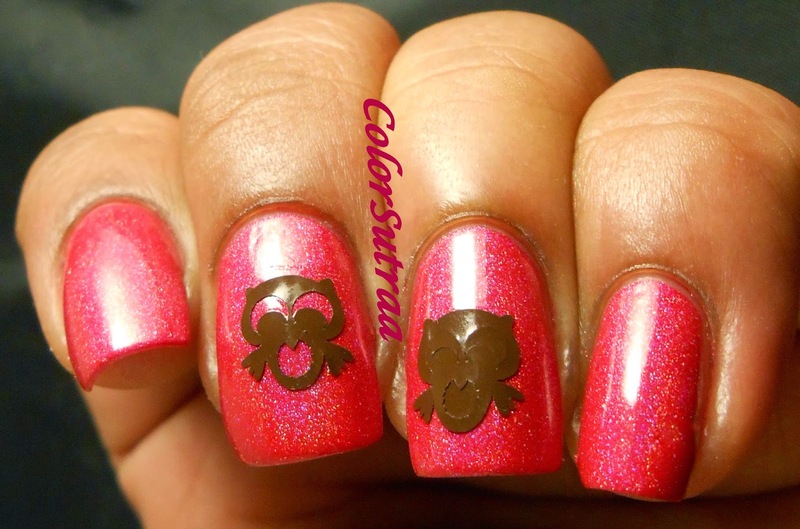 And here's Raspberry Gummy Bear...with OWL nail vinyls! Aren't these super cute!? I chose to show you the decal with and without the eyes and center cut out so you can judge for yourself how you would like to wear them! Last but definitely not the least, I have for you my personal favorite, Poseidon--an aqua blue jelly with tons of holographic shimmer. Application was a breeze and the swatches below show 3 coats of Poseidon, topped with 1 generous coat of ellagee's Fast Dry Top Coat to bring it all together! LOVE love love this polish! 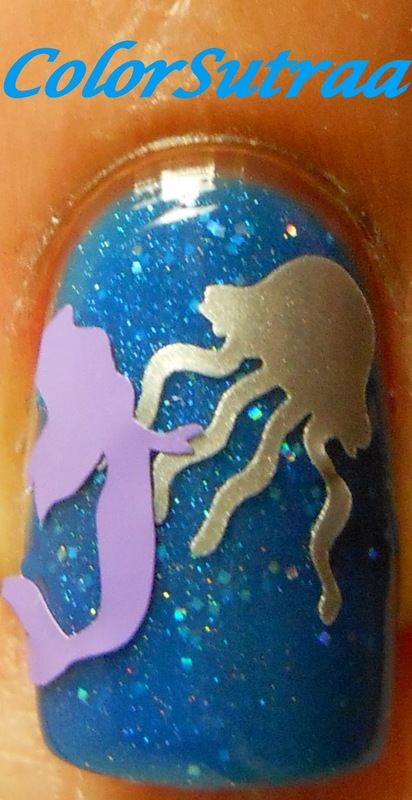 And of course, I chose the aquatic themed decals to go with Poseidon--little purple mermaids and silver jellyfish! So there you have it, my darlings! My very first review of Cat's Eat. Sleep. Polish line! If you would like to add any of these pretties to your stash, you can find her store HERE--a full-size, 0.5 mL bottle can be yours for the price of just $10.00! 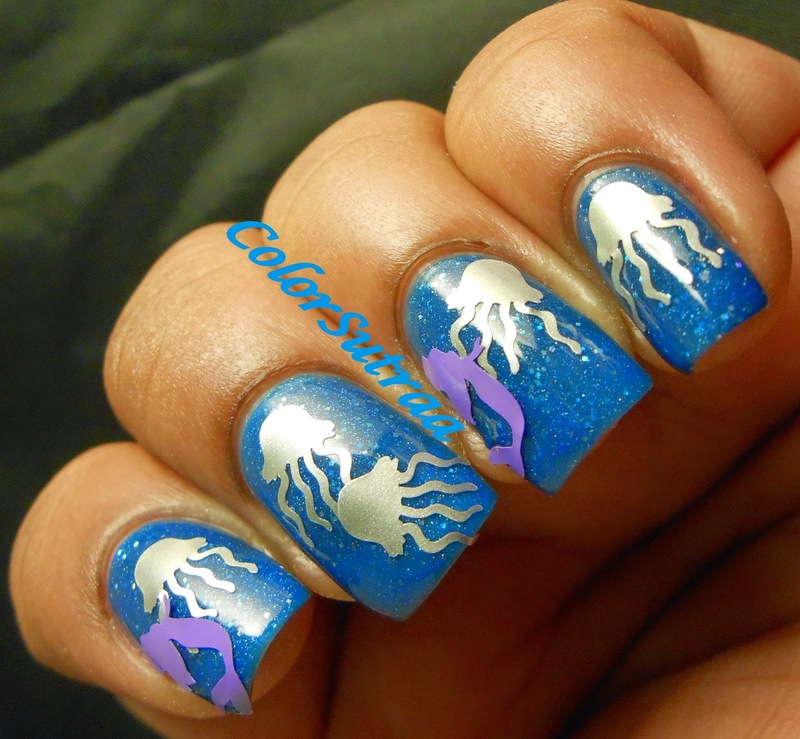 The nail vinyls are priced at between $4.00-$5.00 for a sheet of 60 decals! You can follow Cat on FACEBOOK and on INSTAGRAM for all the latest news and updates! Which of these three are your favorite? Tell me about it in the comments section below!